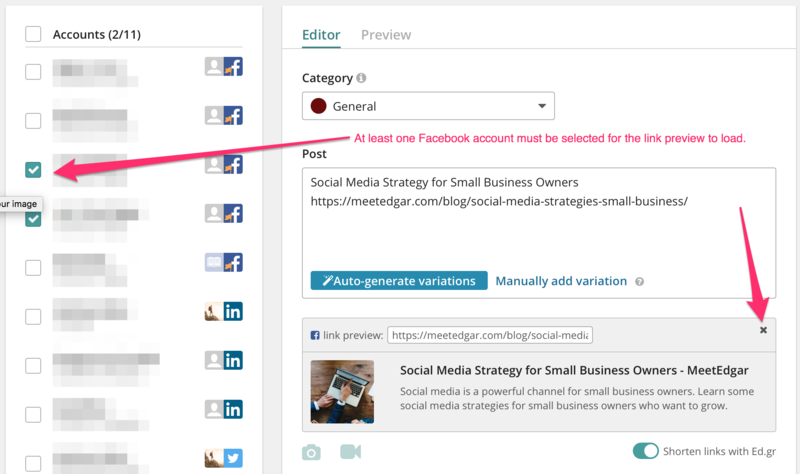 Edgar's Preview Tab shows you what your Facebook posts will look like before you publish them. If you have selected a Facebook account and included a link in the text of your post, a Facebook Link Preview will be generated. 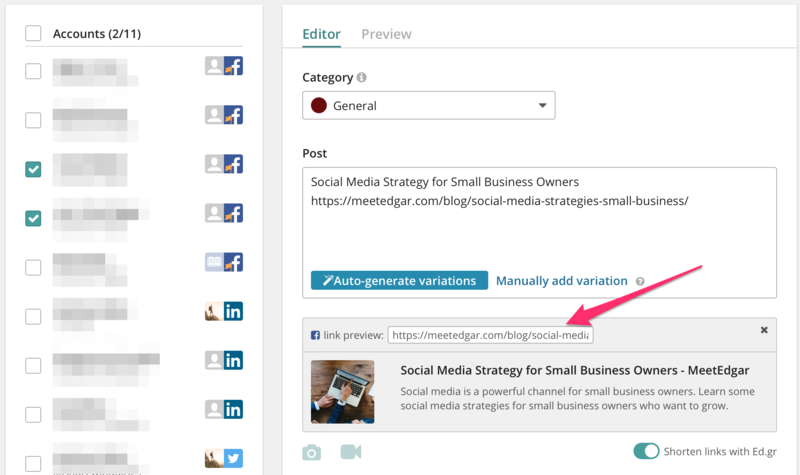 A Link Preview is the clickable box that contains an image from your link, the title of the link, and a short description of the content. You can see the text of your post appears at the top. The image pulled from the link by the preview is in a clickable box with the title and description from the website below it. If you upload an image to your post in Edgar, the post will publish as a photo on Facebook with your accompanying text. Turning off the Facebook Link Preview will result in a text-only post. 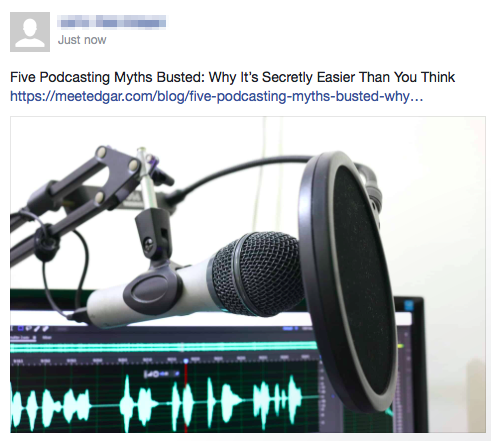 How do I edit or remove Facebook Link Previews? For example, if you have two links in your post and Edgar is currently previewing the second link, you can edit the link in the preview box to change it to the first link. Or you can specify an entirely different link than those in your text. How do I create or edit a Facebook Link Preview? Don't worry! That's not as code-y or difficult as it may sound. These tags can usually be controlled with a simple plugin such as Yoast SEO. If you are not the owner of the website you are linking to and the site does not have the meta tags necessary to generate a preview, there is currently no way to alter a link preview except by bringing it to the attention of the website's owner so they can update their meta tags. However, rather than using a Facebook Link Preview, you can always upload an image to your post in Edgar or remove the Facebook link preview to send a text only post. *Note: Facebook has an 8MB limit on images included in previews. If an image on your website is over 8MB, it will not be included in a link preview. What if Edgar says he can't find a Facebook Preview for my link? Edgar's previews are only approximations of what Facebook will display. 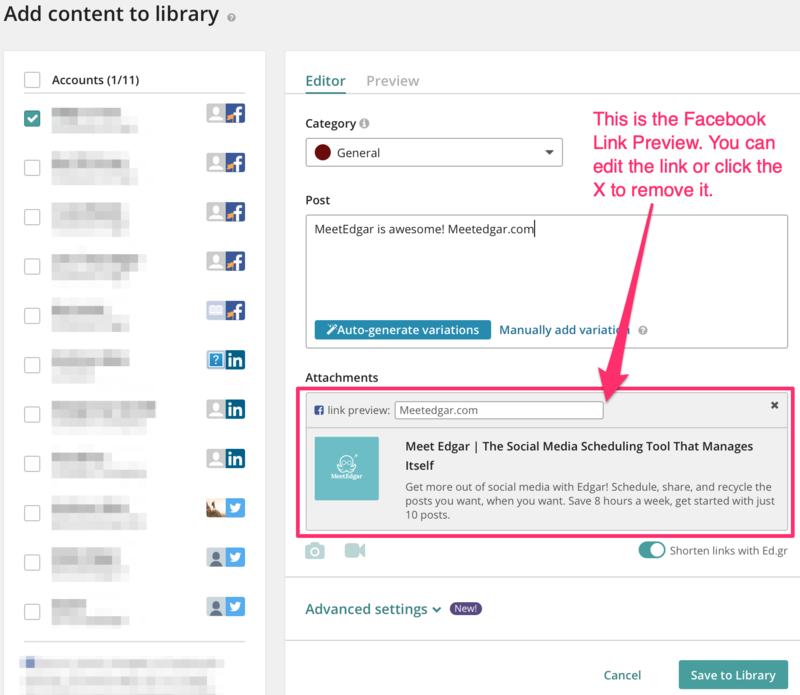 Facebook will check your link and create the link preview at the time the post is published. 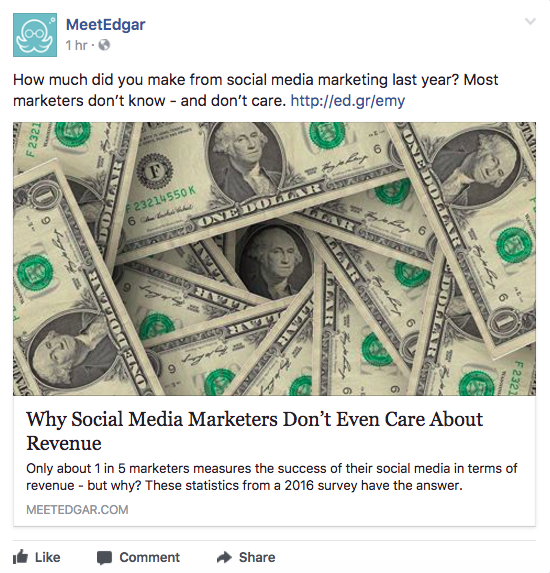 So, even if Edgar can't show you a preview right now, Facebook will still display one based on the meta data on your website. And you can always see exactly what Facebook will show in a preview by using their link preview tool. Edgar may have received a server error from the website, likely due to site maintenance or another issue on the website's end. In most instances, these errors are temporary. If your URL is correct and there are no current server issues, Edgar may be receiving an SSL error from the site. The website will not allow a preview to be pulled due to a firewall or security bot. Give another link from the same domain a try. If Edgar is still unable to pull a preview, this is likely the case. But don't worry. Facebook will still display a preview when the post is published. See what that preview will look like using their link preview tool. Run the link through Facebook's link preview tool to see what Facebook itself is able to pull.